I have been very fortunate to have a brilliant silver clay teacher in Julia Rai who I have now done two courses with and am booked for three more. Julia is the first person in the world to achieve Metal Clay Masters registry level 4 (congratulations!). Sometimes being at the top of your game does not equal a good teacher but Julia is excellent at both the artistry and the teaching! Now that I am getting more confident with the clay my thoughts are turning towards adding colour. I have always loved enamelled silver pieces and have wanted to learn how to do it myself. I was booked onto an enamelling evening class in January but it was cancelled, I presume due to lack of numbers. But then I found that a metal clay artist and enameller, whose work I really admire, also does tuition days and I had to go for it. Joy Funnell is a name I know through doing a google image search for enamelling. Practically every piece I liked and clicked through to turned out to be Joy's! 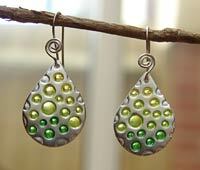 She is a Craftsman of the Guild of Enamellers and a senior Art Clay Silver instructor based in Hastings. I am so pleased and excited that I am going to be learning from her in May this year. It is fantastic that she is a craftsman in both silver clay and enamelling as those are just the skills I want to pick up. I will, of course, post about my day on the blog with loads of pictures! In this post I have included some of my favourites of Joy's pieces from her blog (with her permission). Aren't they stunning? The copyright for all work shown in this blog post is held by Joy Funnell. Thanks Anna, I hope I can live up to your expectations!! Looking forward to meeting you.